Queen Kunti, a tragic and heroic figure, emerges from an explosive era in the history of ancient India. She was a central figure in a complex political drama that led to a bloody fratricidal war for the Indian throne. Yet through all her sufferings she found an inner wisdom and strength that carried her people through the time of crisis. The cover is slightly different from the currently pictured cover. Translation and commentary by His Divine Grace A.C. Bhaktivedanta Swami Prabhupada. This book is based on one chapter from the Srimad-Bhagavatam. 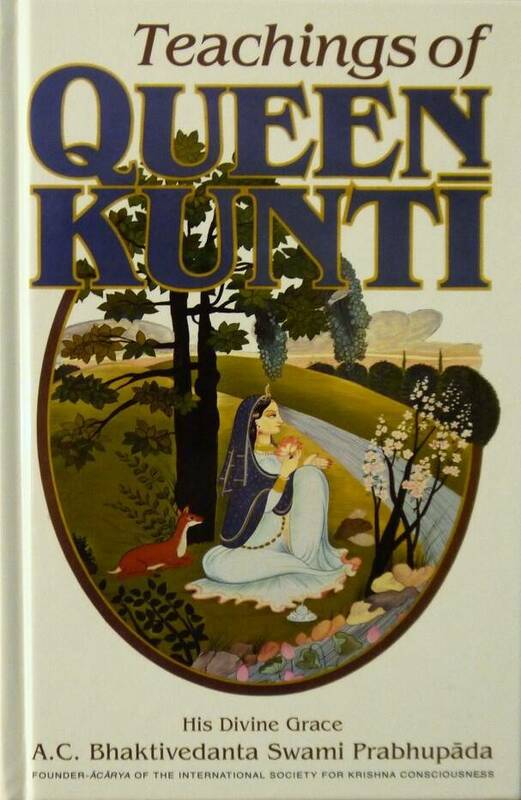 Queen Kunti's teachings are the simple and illuminating outpourings of the soul of a great and saintly woman, revealing the deepest transcendental emotions of the heart and the deepest philosophical and theological penetrations' of the intelect. Here the world's most distinguished teacher of Vedic culture and philosophy, His Divine Grace A.C. Bhaktivedanta Swami Prabhupada presents The Teachings of Queen Kunti with startling clarity and power. "Bodily comfort, however, is not enough. Suppose a man is very comfortably situated. Does it mean he will not die? Of course not. We speak of a struggle for existence and survival of the fittest, but bodily comforts alone cannot enable anyone to exist or survive permanently. Therefore, taking care of the body only is called a pollution of one's duty. "One must know the necessities of the body and also the necessities of the soul. The real necessity of life is to supply the comforts of the soul, and the soul cannot be comforted by material adjustments. Because the soul is a different identity, the soul must be given spiritual food, and that spritual food is Krishna consciousness.